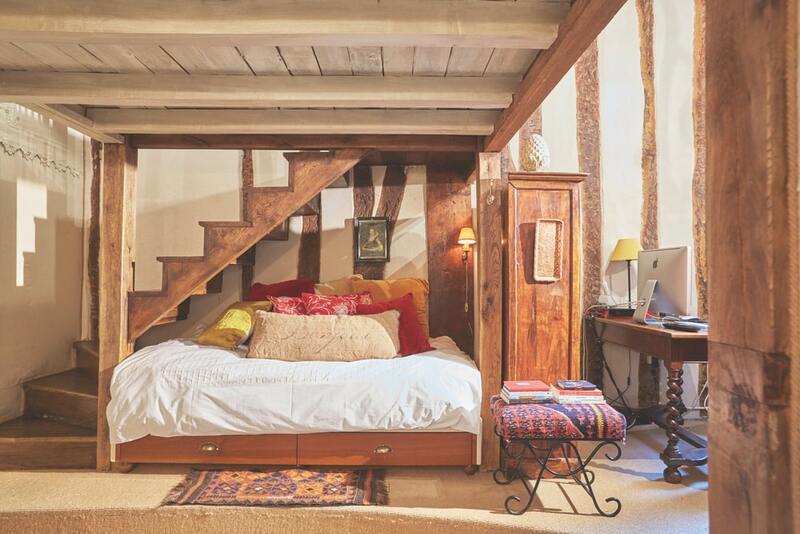 This perfect little pied-à-terre on Île Saint-Louis in Paris was built in 1652 and later renovated by a French filmmaker. It is available for rent through VRBO.com. I’ve always said that I won the “career lottery.” I’m lucky enough to get paid to travel the globe taking pictures and seeking out stories to tell about the coolest people, places, and things. So, off I went searching to find just the right destinations. The perfect Paris; the Paris of all of our dreams. Thank God for the Internet, VRBO, and friends in the know. From the hardwood floors to the exposed-beam ceilings and antique furnishings throughout, “Juliette” is dripping with authentic French charm. Île Saint-Louis is teeming with charming shops and markets full of fresh fruit, flowers, and more. The brass accessories seen here were purchased at the Porte de Vanves flea market in the city. 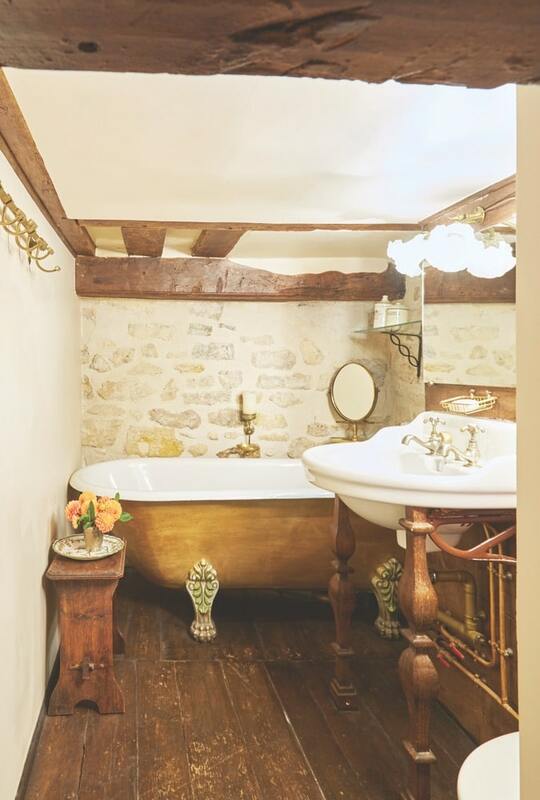 The luxurious clawfoot tub makes an otherwise tight-quartered bain feel like a relaxing hideaway. I was happy to finally get to travel without dragging my luggage into the lobby of an overbooked hotel. Although there is nothing like room service and the other luxuries of a good hotel, there is something to be said about walking into a place that feels like home. When I arrived at “Romantic and Enchanting Juliette,” as it was called on the Internet listing, I knew I had found the perfect Paris. 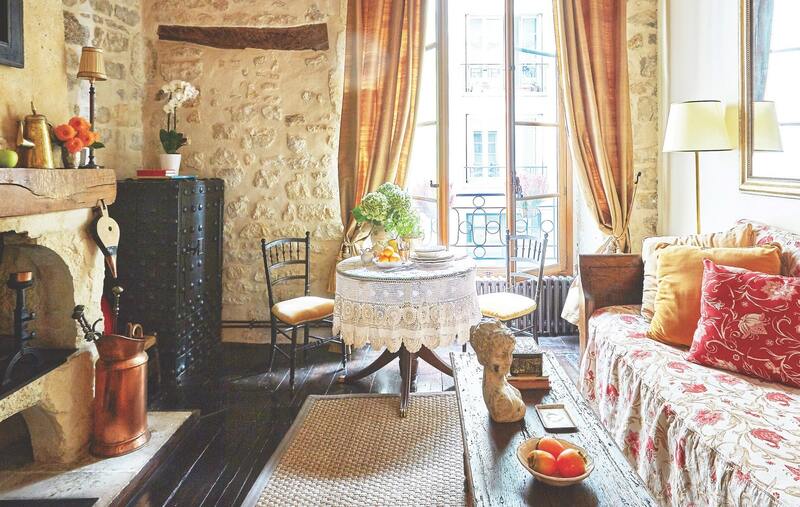 This jewel of an apartment is on the quaint Île Saint-Louis in the middle of the Seine. If you have not been, it is absolutely the perfect location for a Parisian pied-à-terre. 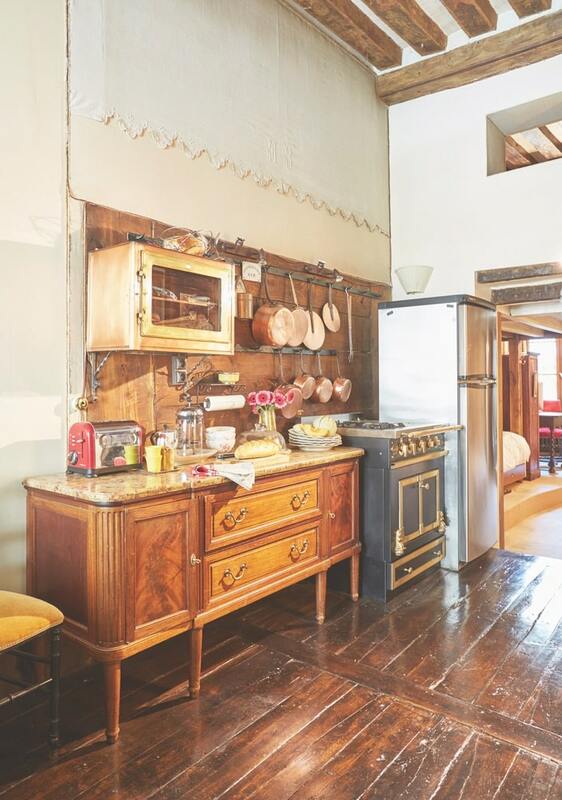 This jewel of an apartment is on the quaint Île Saint-Louis in the middle of the Seine. If you have not been, it is absolutely the perfect location for a Parisian pied-à-terre. The apartment was constructed in 1652, and a French movie set designer oversaw its more recent renovations. I felt like I was walking into and living in the most romantic French film ever. Who doesn’t want to feel that way? True love, here I come! I had to remind myself I was there to work. My Parisian love would have to wait. Virtually every element in Juliette is custom, from the seventeenth-century hardwood floors to the hand-painted renaissance-era beams and exposed stonework. From a photographer’s perspective, it is a treasure trove filled with amazing antiques and props galore. Styling the apartment for my photo shoot was the best part. Île Saint-Louis is nestled between the Left Bank (the Latin Quarter) and Right Bank (the hip Marais district). Its cobblestone streets are lined with cafes, boutiques, flower shops, antique stores, and, of course, patisseries. The island was everything I’d ever wanted Paris to be and the perfect place to gather props for a photo shoot. Children staying in the vacation rental have referred to this as the “Harry Potter bed” thanks to its placement under the stairwell. 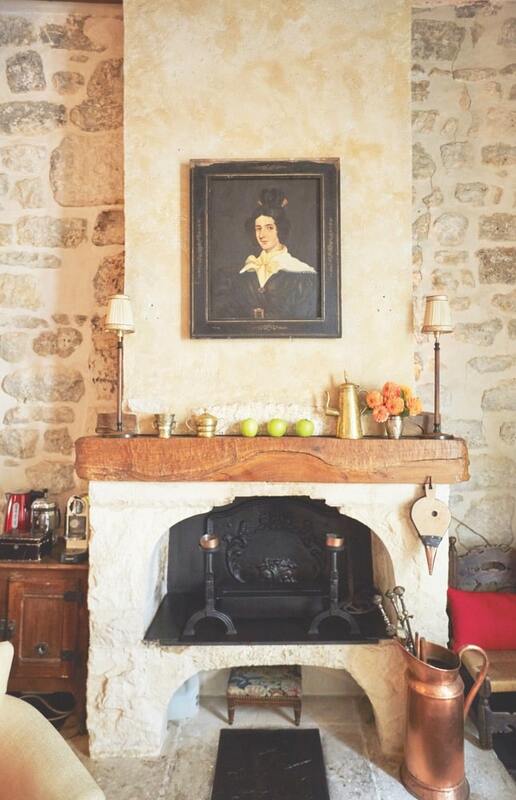 The warmth and character of the apartment were created by the former owner, the wife of a French senator who scoured the flea markets and villages around Paris to create the ambiance of seventeenth-century France. And luckily for me, a spoiled American, Juliette also has all the modern amenities, including Wi-Fi and luxurious spa-like bathrooms. My new love affair with Paris began on this shoot, and I know it was because of this specific apartment. Visiting the host’s list of recommended meat markets, flower shops, and antique stores gave me a real connection to the city and made me feel like an honorary Parisian, not just a tourist. The props and food we gathered for styling the apartment later became yummy meals for my assistant and me. Not to mention the famous eggs Benedict at the Café Saint-Régis and morning runs along the Seine that made staying at the charming Juliette seem more like a sojourn in the City of Lights rather than an assignment. I can’t wait to head back to Paris on assignment, and of course, I’ll be staying at Juliette. The next time you travel to Paris or any major city, I recommend you skip the hotel and try de vivre comme un local! Visit PerfectParis.com to book your stay.